If you have any old speaker systems or boomboxes lying around the house, Beep has a plan to usher them into the Internet age. 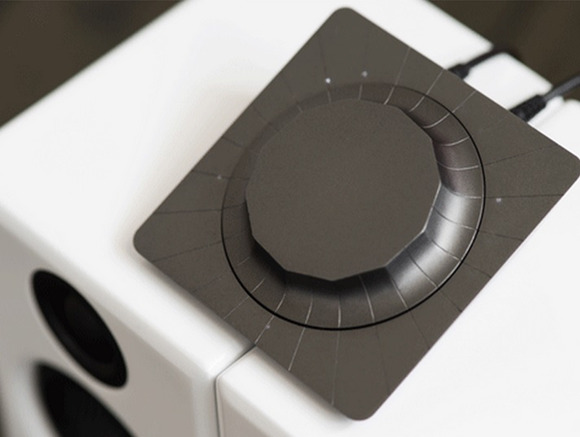 Beep is a $150 device that lets you wirelessly send music from a smartphone or tablet. It connects to your home Wi-Fi network, and any iOS or Android apps that support Beep will display a button for beaming your tunes. As Engadget points out, Beep works a lot like Google’s Chromecast TV dongle, but for speakers. (The company was co-founded by two former Google employees, after all.) Instead of receiving audio directly from the phone or tablet, Beep merely gets instructions for streaming that music from the Internet. This allows users to control playback from multiple devices or leave the house while letting the music play. Similar to Sonos, Beep can also synchronize playback to multiple speakers—up to five at once on most Wi-Fi networks. On the downside, Beep will only launch with support for Pandora and its own Beep app for playing locally-stored music files. The company is hoping that more apps will come later, but it isn’t making any promises just yet. The wedge-shaped hardware has a large dial on top. Tapping the dial starts and stops playback, and twisting the dial adjusts volume. In back, there’s a 3.5 mm optical jack for audio output and a micro-USB input for power. Beep says it supports pretty much any speaker with a 3.5 mm auxiliary input, optical input or an RCA jack. If you don’t already have a bunch of extra speakers, Beep isn’t necessarily a cheaper or better solution than Sonos, with its $50 Bridge connector and $200-and-up speakers. Sonos also supports many more apps right now, including Spotify, Rdio and Amazon Cloud Player. But for users who already have good speakers on hand, Beep could save you some cash, especially with the current pre-order pricing of $100 per unit. Besides, the idea of pushing music from a smartphone to speaker with the touch of a button—no cumbersome Bluetooth pairing required—is pretty alluring. Engadget reports that down the road, Beep could even license its technology to speaker companies, allowing for built-in streaming similar to what Apple has done with AirPlay. Beep hasn’t given a firm release date yet, but plans to ship the product this fall.